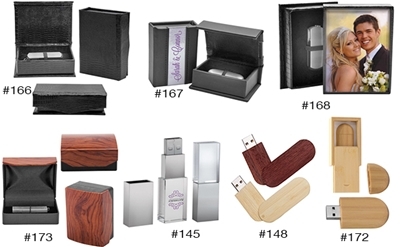 Attractive offerings for your USB, Flash Drives or Thumb Drives for client Digital Images. • Each Album Box is covered in a shiny black imitation crocodile pattern. • Album box is kept closed with a simple magnetic flap. • Standard Thumb Drives are held in place by elastic strap and set into a soft black velvet lining. PS166 - Basic Jump Drive Box $54.00 for 12 Album Boxes. • Perfect for wallet sized photos. • The thick acrylic cover protects your photo. • Made from a black synthetic leather. • The box stays closed thanks to the magnetic closure flap. • A creative way to present digital files to your client. PS167 - Modern Jump Drive Box $67.00 for 12 Boxes. • Insert size: 2.875” x 3.875"
• The cover of the box displays one photo. • The thick acrylic cover with a beveled edge protects your photo. • Poke out acrylic cover from the inside of the box to insert a photo. • This box separates in order to store a flash drive. PS168 - Elite Jump Drive Box $81.75 for 12 Boxes. • The box lid is magnetic and slides off. • This box comes with a 8GB flash drive made of bamboo. • White foam holds the flash drive in place inside. • Color imprinting available for both box and drive. • Call or email us for an imprinting quote. • Overall size: 2-5/16" x 11/16"
• Imprint area: 1" x 1/2"
• USB hidden under silver cap. • Imprint in full color on the flash drive's large area. • Goes great with one of our flash drive boxes. PS145 - 8GB Acrylic Flash Drive $137.00 for 6 Flash Drives. • Imprint area: 2" x 3/4"
• Hook your flash drive to a keychain or tie it to a ribbon. • USB drive swivels open or shut. PS148 - 8GB Wood Flash Drive $90.00 for 6 Flash Drives. • This box has a fine wood finish and the bottom is made of a synthetic leather. • Box is closed by a magnetic folding flap. PS173 - Wood Thumb Drive Box $68.50 for 12 Drive Boxes.